24/7 AT WORK, detail, self-maintenance products and books set up post-and-lintel style, Peacock Visual Arts, Aberdeen, Scotland, 2008. 24/7 AT WORK, self-maintenance products and books set up post-and-lintel style in vitrine with intro panel, Peacock Visual Arts, Aberdeen, Scotland, 2008. 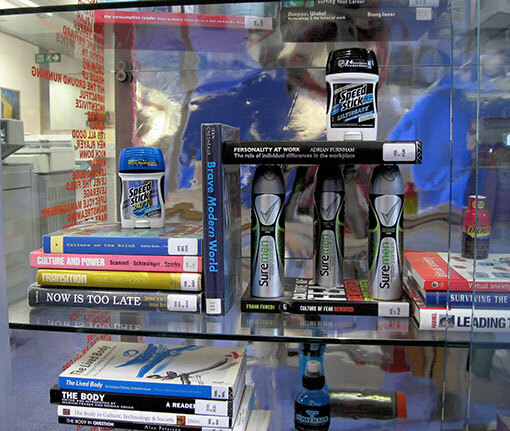 24/7 AT WORK, self-maintenance products and books set up post-and-lintel style in vitrine with ‘management speak’ list in sign vinyl, Peacock Visual Arts, Aberdeen, Scotland, 2008. 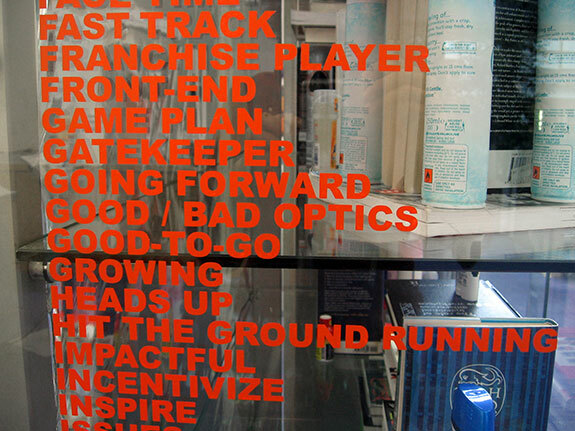 24/7 AT WORK, detail, sign vinyl, ‘management speak’ list, Peacock Visual Arts, Aberdeen, Scotland, 2008. 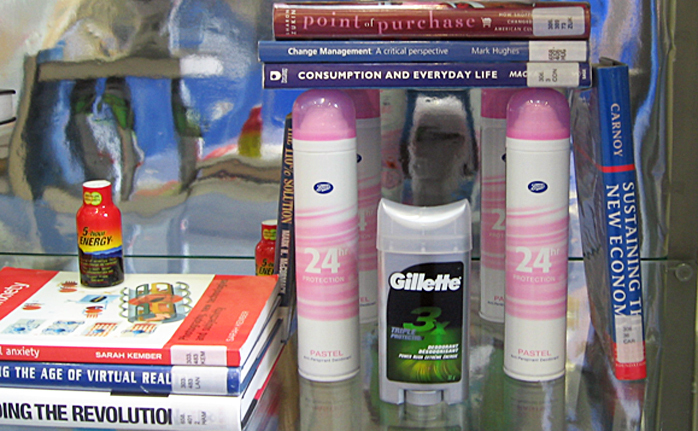 24/7 AT WORK, self-maintenance products and books arranged in vitrine, Peacock Visual Arts, Aberdeen, Scotland, 2008. 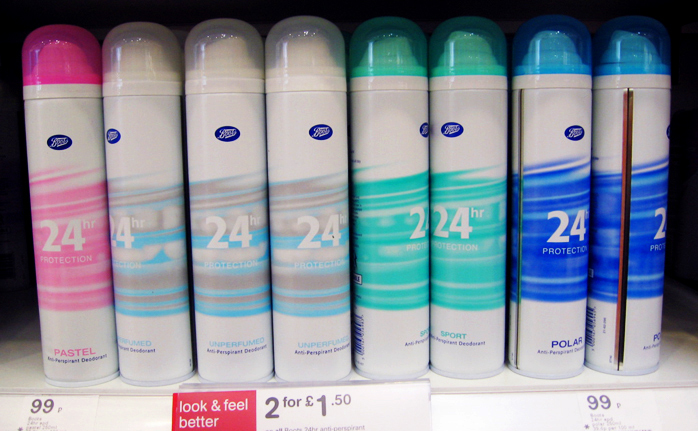 Boots Pharmacy, anti-perspirant shelf, sketch for 24/7 AT WORK, Peacock Visual Arts, Aberdeen, Scotland, 2008. Library building designed by Norman Foster. 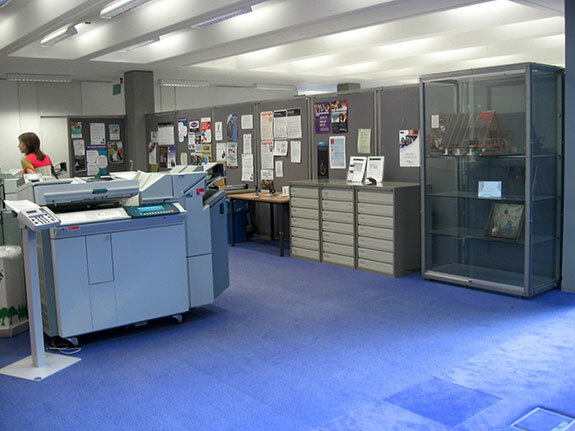 Inside, 24/7 AT WORK, Peacock Visual Arts, Aberdeen, Scotland, 2008. 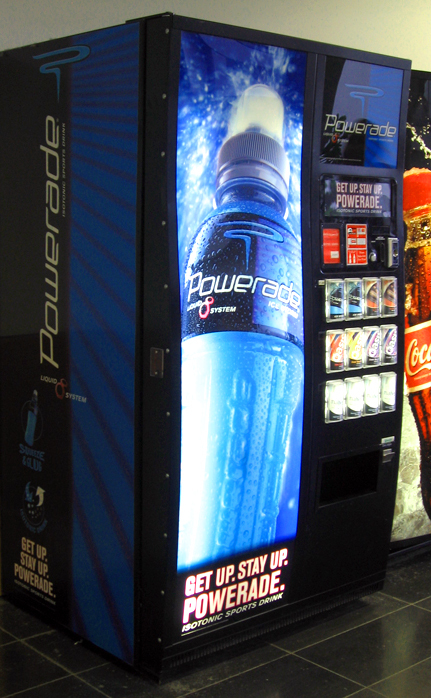 Powerade dispenser in Library building, sketch for 24/7 AT WORK, Peacock Visual Arts, Aberdeen, Scotland, 2008. 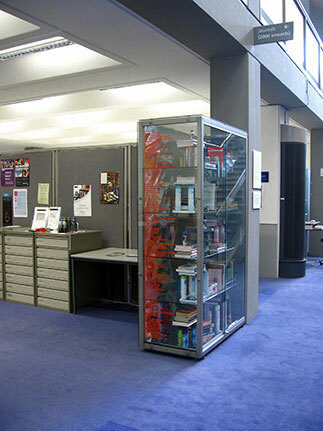 Vitrine designed by Norman Foster before installation, 24/7 AT WORK, Peacock Visual Arts, Aberdeen, Scotland, 2008. 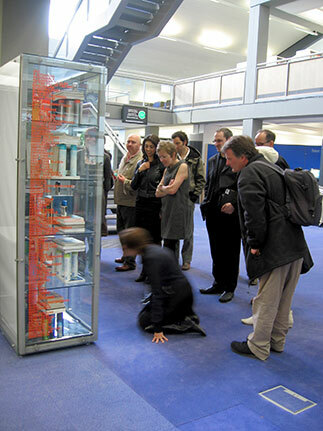 Opening event, 24/7 AT WORK, self-maintenance products and books set up post-and-lintel style in vitrine with ‘management speak’ list in sign vinyl, Peacock Visual Arts, Aberdeen, Scotland, 2008. 24/7 AT WORK was part of No Time To Lose, curated by Melina Placentile for Peacock Visual Arts, Aberdeen, Scotland (2008). 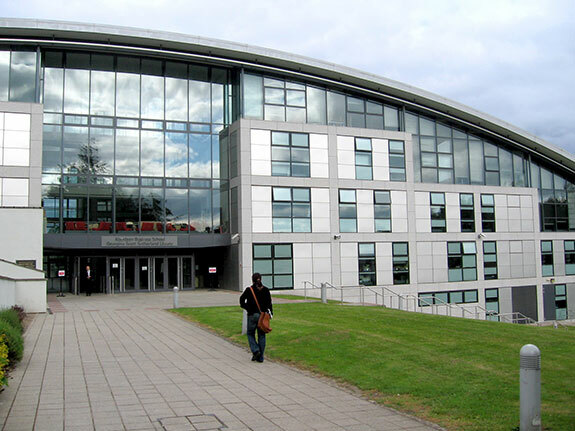 It was located site-specifically at the Aberdeen Business School Library, Robert Gordon University. 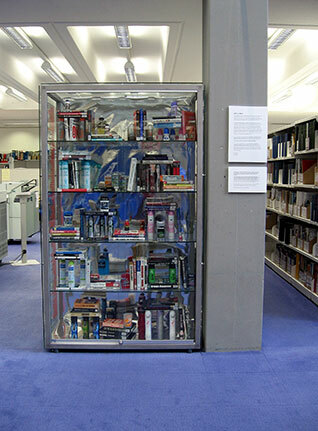 The work was made up of a list of ‘management speak’, a collection of self-maintenance products, like deodorants and power drinks, along with management and critical books from the library. A vertical vitrine was positioned by the main entrance just past the turnstiles and beside the photocopiers. A secondary low-rise vitrine was located between these turnstiles. In 24/7 AT WORK, products aimed at promoting an inexhaustible worker are used to suggest a critical narrative on work-life trends. Read more 24/7 AT WORK.